Sleeping bag – Rab Quantum 200, stuffed into a POD compression drybag, with homemade handlebar strapping system. I was really pleased with how well this worked. Everything stayed nice and tight after a few adjustments early on, and the dry bag did its job despite some poor weather. Tent – Terra Nova Laser Photon stuffed into a Granite Gear No. 1 stuff sack. Sleeping mat – Thermarest Neolite short. A comfy, if slightly noisy, compact and lightweight mat. Stove – Vargo Triad – titanium meths stove; 100ml of methylated spirit (enough for two days), homemade stove base and wind shield. This worked well, easily boiling the water for me to re-hydrate my Expedition Food meals. Pan – Tibetan Titanium 550ml pan with wire handle. Capacity to hold enough water for a meal or large drink, small enough to fit nicely over the end of the tent. Misc – Black Diamond Ion head torch, first aid kit, survival bag, waterproof trousers. Food – Expedition Foods dehydrated meals, some flapjack bars, small bar of chocolate and some chocolate coated coffee beans. Do apricot flapjacks count towards one of your five a day? The frame bag is lovingly stitched together by Beth from 2oz denier coated fabric, with a waterproof zip, good thread and 2in wide velcro to keep it snug within the main triangle and sealed with seam grip to keep out as much water as possible. Overall cost about £15. Weighs only 87g. This is the second version Beth has made, with a few improvements over the first version in terms of width, zip design and stitching the straps in with the main seams. The fabric, whilst light, is not likely to be as durable as a 4oz fabric, so a third version is likely to be required at some point. 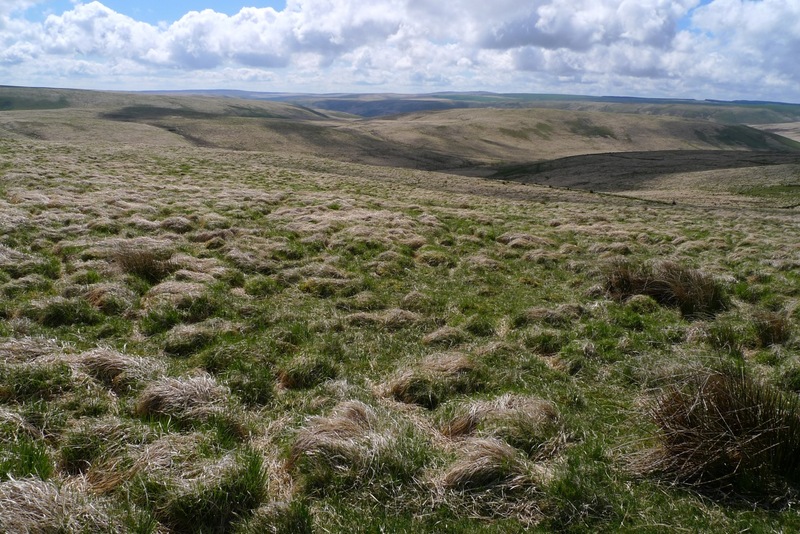 In terms of somewhere to go, I’m inclined towards the area around Llyn Brianne, via Mynydd Eppynt. I’ve not ridden Doethie Valley at all this year, which is one of my favourite pieces of trail in those parts. 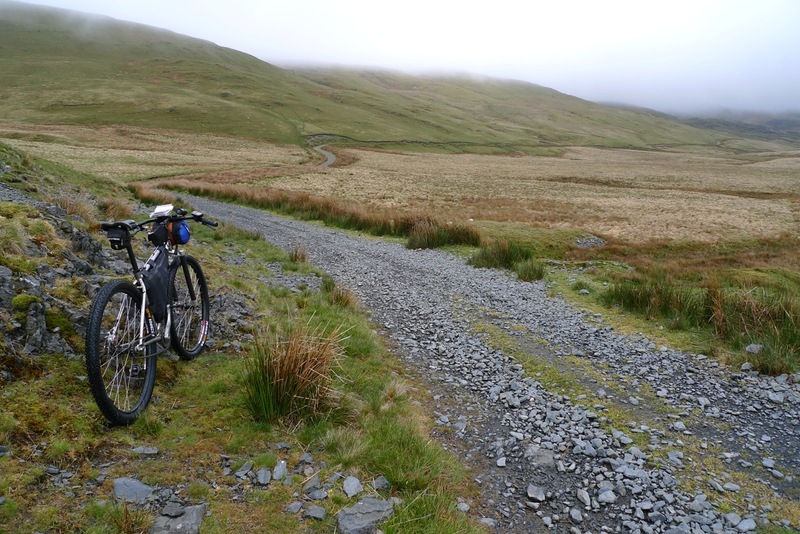 The weekend of the Welsh Ride Thing still brings me out in a grin when I think about it. Packed with memories of rain, wilderness, bothies, open fires, whisky, sunshine, singletrack, fireroad, river crossings and socialising with thirty odd like-minded riders who got together for a weekend of exploring the Big Welsh Wilderness. Saturday’s rain wasn’t particularly heavy, but quite persistent. My choice of 32:20 gearing wasn’t quite as light as I would have liked, but any lower and the flat sections would have been tedious. My progress was slower than I had planned, a combination of weather, riding a loaded bike and hard (but enjoyable) trails. 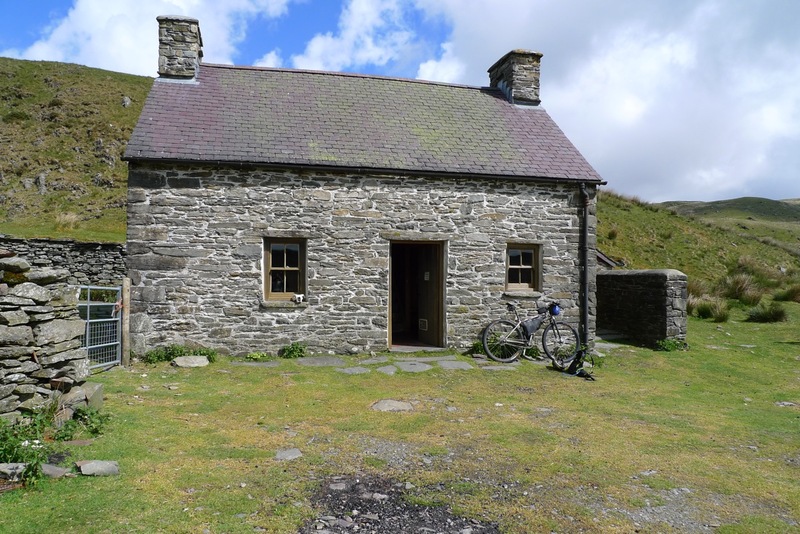 I chose to trim my route a little and headed for Claerddu – a remote bothy I’d not been to before.To my surprise, I was the only one there when I pulled up at 8pm. It concluded a 40 mile ride, which had taken in some great tracks, though not in the best conditions. I had enough time and light to get the fire going and cook up some food. Another WRT rider arrived at about 9pm, and we shared tales of the days riding. Sunday dawned with patchy cloud and warm sunshine – a welcome change from the day before. I headed NE along Monks Trod, a route I am familiar with from previous exploits and one that can be either magnificent or miserable depending on the weather and/or the choice of line. Today, though, it was magnificent. An hour and half since leaving the bothy, I was back on the mountain road. 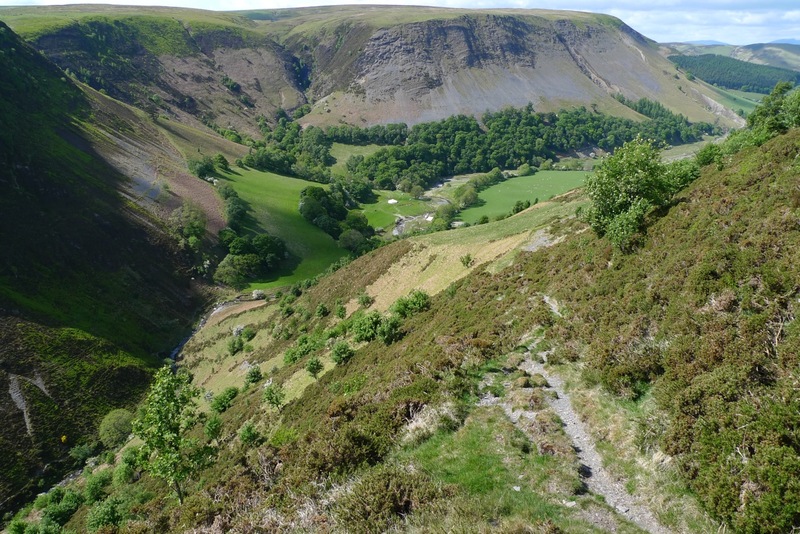 A stiff climb lead me to Nant Rhys Bothy, before a long forest descent took me back into the valley to the north. Hafren Forest lay the other side a long winding climb through a broad valley bathed in sunshine. Hafren Forest was a delight to ride through. 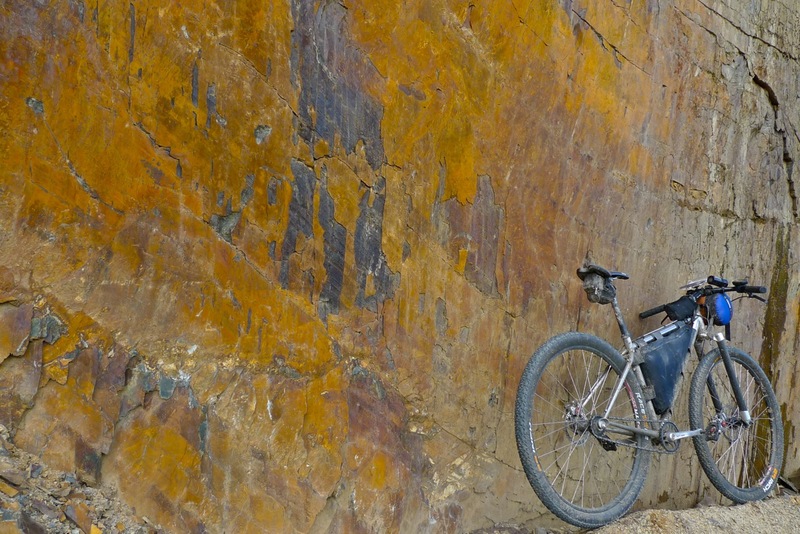 I seemed to miss all the singletrack, not really knowing the area, but instead stumbled upon a fantastic waterfall and the above pictured quarry with its iron tinged wall. I rolled back into Pennant with another 40 miles ridden to conclude an excellent two days of riding. New trails, new people, new places and new inspiration to head out into the Welsh Wilderness some time soon. The whole weekend was a great departure from the normal riding I do, and a world apart from my previous racing endeavours. Check out all the pictures I took over the two days here. A while ago I did some research on recharging devices that charge via a USB connection (i.e. 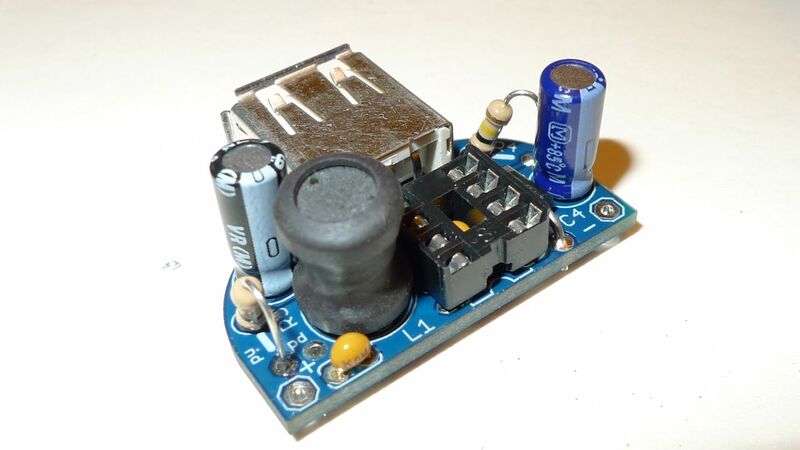 5V DC) using the power from other batteries. 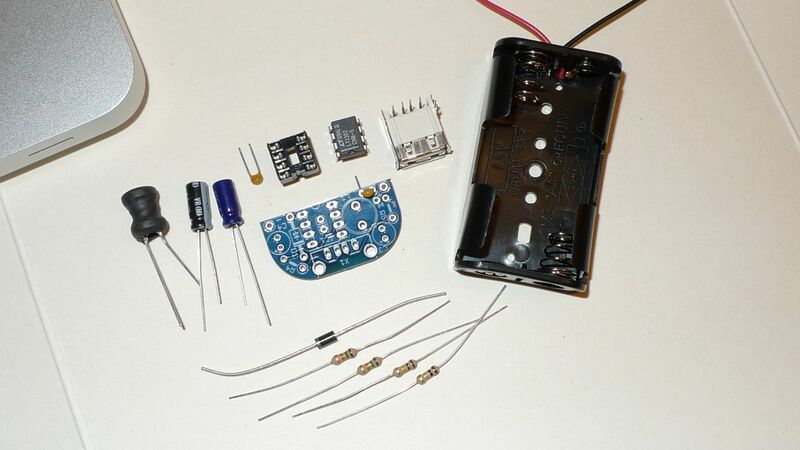 Not having done any electronics since school, a simple approach was required that wouldn’t be too difficult to build. My first effort was based around a linear 5V regulator and a 9V PP3 battery. It worked, sort of… The problem was that it wasn’t very efficient. I would get about half a full charge from one battery, and the effects of reducing 9V to 5V produced a fair bit of heat. Most of these shortcomings stemmed from the limitations of the PP3 battery. After further research, I found a neat device called the MintyBoost which was designed to boost two AA batteries (~3V) up to 5V. The capacities of AA batteries are much better than PP3 (less internal resistance and much higher mAh rating). At $20 for a DIY kit it looked a good solution to the problem and a bit of fun to build it. On the left: this is what you get in the packet. The image in the middle is the result of 20 minutes work with a soldering iron, no swearing, burns to self or marks to the dining room table. On the right with all soldering complete, it fits neatly into a tubeless tyre repair kit box and gives me enough room for charging lead too. 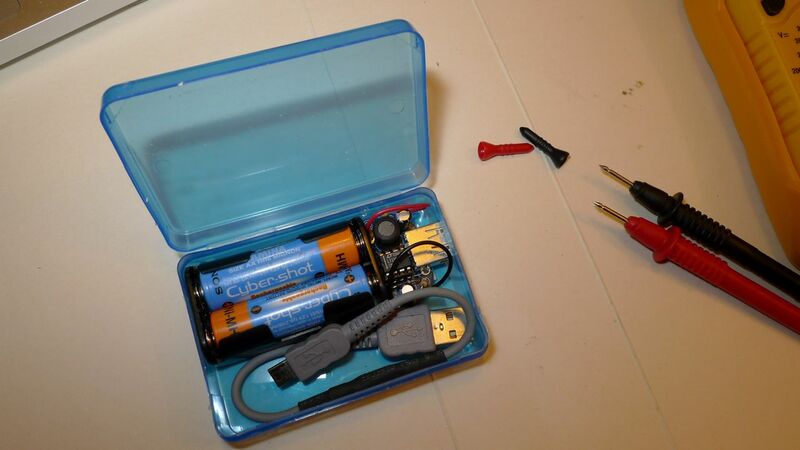 So this kit will give me about two charges for my GPS from 2 AA alkaline batteries. It’s perfect for the short touring rides I have planned, or seeing as I can pick up AA’s in most small shops, it would be of use for much longer trips. It only weighs 87g too, so no serious weight penalty either. Putting my (now not so) new tent to some use seems to be cursed, at least in the context of using it for an event. Still, with all the time I’ve spent sorting out bits and pieces of kit to keep me warm, dry and adequately fed for an overnight excursion, it’s high time I got out there and put it to proper use. I used to do a bit of bike camping (or bikepacking as they call it) many years ago, and while I’m not racing seriously just now I’m looking forward to getting out into the hills again with the tent. The compression bag under the bar contains the sleeping bag. In the frame bag is a tent, sleeping mat, stove, fuel for three days, pan, torch, first aid kit, survival bag, waterproof jacket and trousers, and food for two days. The seat pack contains tools to fix just about anything on the bike. I’d also carry a small rucksack with water, and a few light essentials. Beth made the frame bag up for me, and now that we’ve learnt a thing or two from it, the second version should be a lot better. Five is something of a nice round number, and I was quite pleased when I finally achieved it. Four, on the other hand requires a good deal of thought, research and a little bit of compromise. What am I talking about? The weight of a pack of kit for a Polaris Challenge. If you’re not familiar with the Polaris Challenge, its two days of MTB orienteering with a wilderness camp. 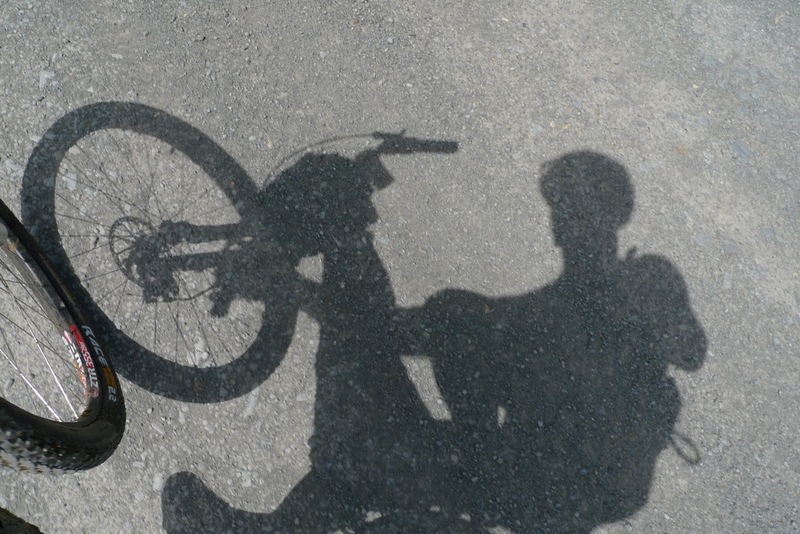 You have to carry all your gear with you for both days for up to 12 hours of riding and be completely self-sufficent. The event has been around for years, and is probably the route of my competitive interest in mountain bikes (not least for the fact it not all about fitness). I’ve done over 15 in total, with a 2nd and 4th place being my most creditable placings. I’ve also organised one, and I have another in the pipeline this Spring. Anyway, I digress. After a casual comment on the PC forum, I looked hard at my 5 kg kit list starting to think of ways to save weight. Cutting the weight of something you depend upon for survival by as much as 20% will take some doing, but having spent a bit of time researching various lightweight camping equipment websites and blogs, there are no shortage of ideas out there. Hopefully next time I jump on my bike with a rucksac stuffed with tent, sleeping bag, stove, food, spare clothes and all the other mandatory bits of kit required for the event, it won’t weigh any more than 4 kg, less than 9 lbs.